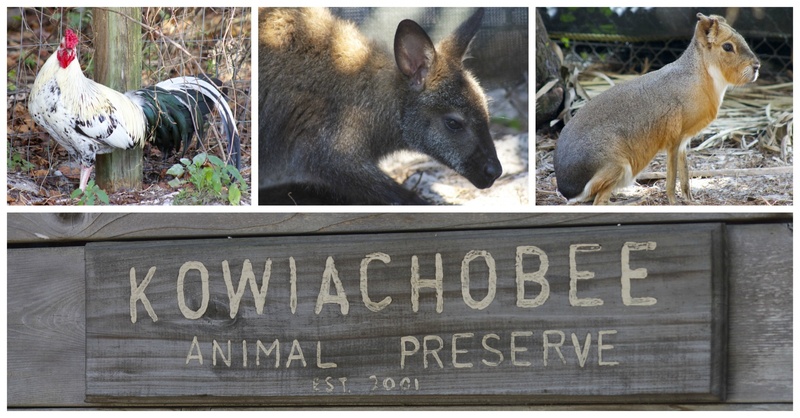 Kowiachobee Animal Preserve is a non-profit educational facility located in Collier County in Southwest Florida, just a few minutes from Naples. KAP rescues and adopts exotic animals that might have otherwise be euthanized or released into the wild because people that had purchased them as pets or for other purposes could not care for them anymore. They have a little bit of everything from farm animals like turkeys, horses and donkeys to wallabies, Patagonian maras and big cats. KAP’s primary focus is elementary aged hands-on education. 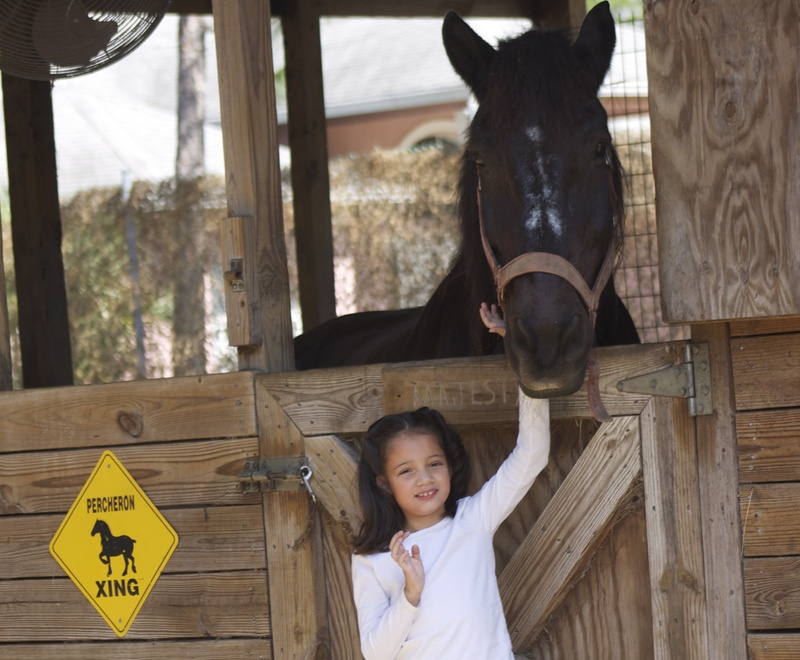 At Kowiachobeen children can feed and pet Maggi the Percheron horse, dwarf goats, skunks, wallabies, iguanas and boas. What makes Kowiachobee different from a zoo or a petting farm is that there is a wide array of exotic animals and that many of the animals there have stories we can learn from: like Diablo the jaguar who suffers from arthritis because he was kept in a concrete floored cage by his previous owner. There is nothing like being in contact with nature to help people develop an understanding for the importance of conservation and it all starts with kids. Kids and their attitude towards the environment and the animals will determine what the future is for many species. They will be making judgments that will affect not only their future, but also the future of the animals living in those habitats and locations. Baby dwarf goat, just 4 days old. 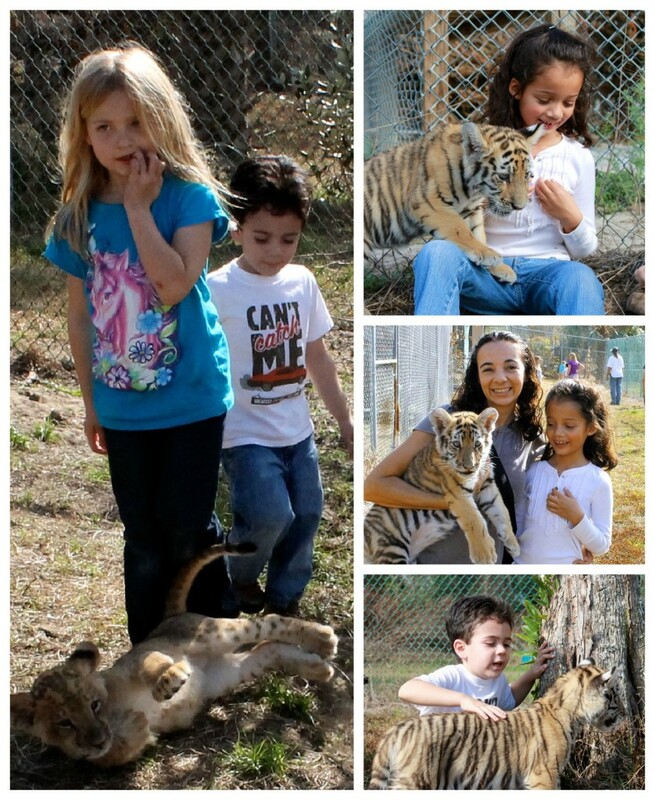 We had been at Kowiachobee last year and got to meet and pet Czar and Shaumbay, an African lion and a Bengal tiger. The kids where literally jumping up and down with excitement when I told them we would be going back to see how Czar and Shaumbay had grown and to meet the new 11 week old baby tiger Sabeena. When we arrived we where met by a volunteer who took our family on a tour showing us every animal and telling us about their species, the specific animal’s personality and about how they had gotten to Kowiachobee. This made the experience so personal and the kids really felt like they got to know each animal and connect with them because they where learning so much about them individually. Some of Kowiachobee’s big cats. My children had the time of their lives. They got to pet a very playful wallaby, held a 4 day old baby dwarf goat who still had her umbilical cord hanging from her belly, witnessed how moody a huge iguana can be when she is in mating season, realized how cuddly a skunk is and that a boa has the softest skin. All of this before we even got to the big cats. Kowiachobee has a total of 11 big cats including lions, tigers, jaguars, pumas and panthers. Our tour guide knew what each one of the big cats liked and told us how each one identified and connected to different staff members and volunteers. 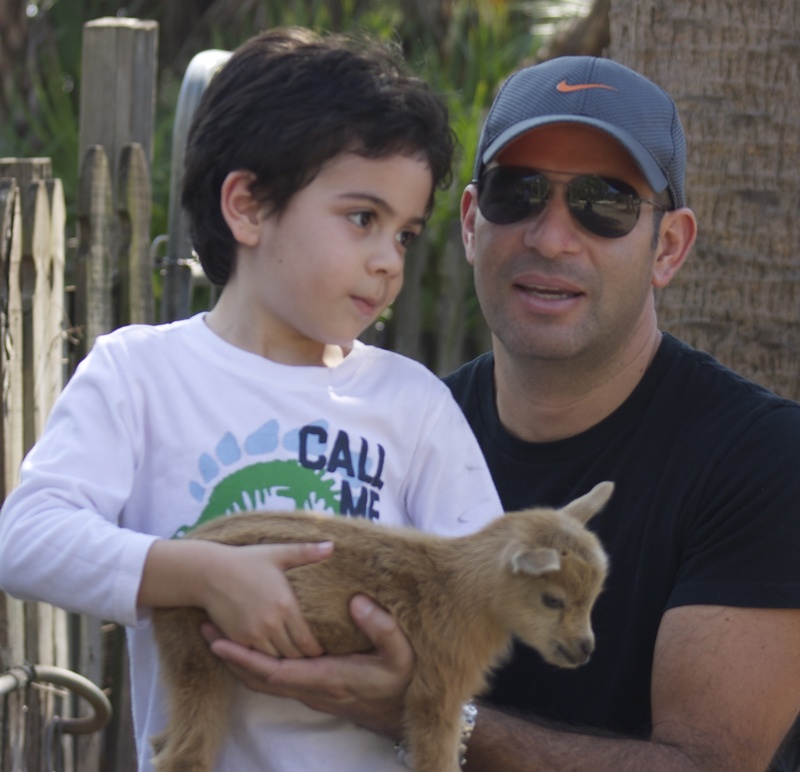 Petting the animals at Kowiachobee Animal Preserve. Finally we got to where Czar and Shaumbay where and we just couldn’t believe the little babies we played with just a year ago where now more than 200 pounds. Since they grew together they formed an amazing bond. They are in the same cage and play all day like siblings. Czar and Shumbay when they where babies in 2012. After saying hi to our old friends we met Sabeena who was a little tiered and cranky and was more interested in chasing butterflies than anything else. The kids loved that she was on a pink harness just like a dog and petted her as she ran around. She was so alert ,looking at every little thing that moved around her. As she walked on the side of Czar and Shaumbay’s cage we couldn’t help thinking how amazing it was that she would become as big as them in just one year and double her weight to around 400 pounds by the time she turns two. 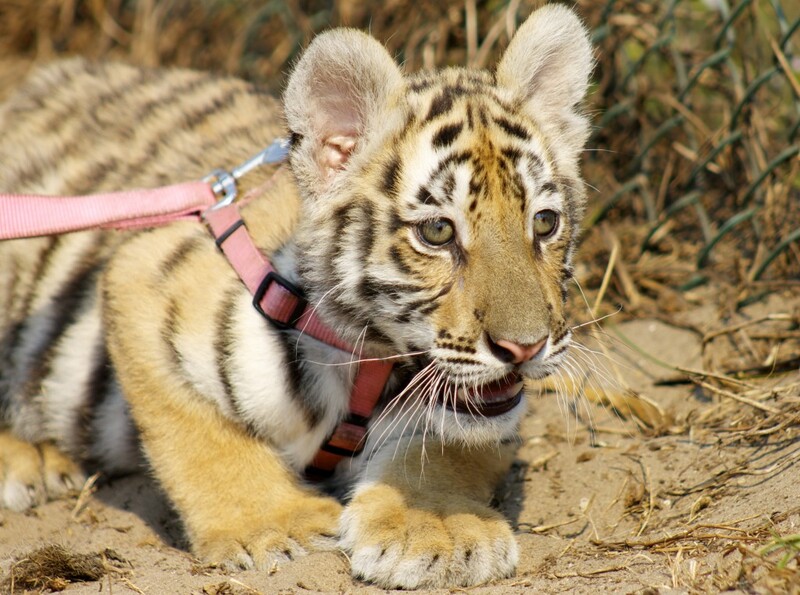 If you want to be able to pet Sabeena the baby tiger you must hurry and visit them soon because big cats can only be petted if they are under 25lb and baby tigers grow fast! Sabeena on the prowl at Kowiachobee Animal Preserve. Families, schools, social groups, and communities can visit the preserve and learn about the animals they care for by making an appointment. Kowiachobee survives through the support of the community so they ask visitors to leave a donation. They also have animal sponsorship packages. Their child sponsorship package is a wonderful program for kids that gives children the opportunity to sponsor an animal for only $10 quarterly ($40 annually). The children can choose from the animals available on their website and receive a personalized certificate of sponsorship, information on the animal they are sponsoring, species facts and a quarterly animal update e-newsletter along with their name included in the Kowiachobee Animal Preserve Wall of Fame. Check out their website to see how you can volunteer and for a donation wish list. Follow 365 Things to Do In Southwest Florida on Facebook for more great ideas, events and activities for the whole family. You girls are very brave playing with the baby tiger. Beautiful place, pictures and family. Wow,,, Amazing place !… Thanks for pics, your family is beautiful!.. I’m adding this to my To-Do list! My son would absolutely LOVE to touch and hang around all the animals. Can’t wait to take him and create wonderful family memories! Me encantó este lugar y seguro que mi niña se divirtiría mucho allí. Ojalá pronto pueda llevarla, porque está en una edad en que los animales le fascinan. Yo quiero ir!! Me encantaron las fotos y esos planes me encantan! Que lindo lugar! Me encantan los lugares donde se tienen contacto con los animales! Se ve que disfrutaron mucho! I had no idea this was so close to me. I really want to go!